Our 2013 project is an historical novel that goes back to AD 300 in ancient Britannia where the Romans control most, but not all of the island. 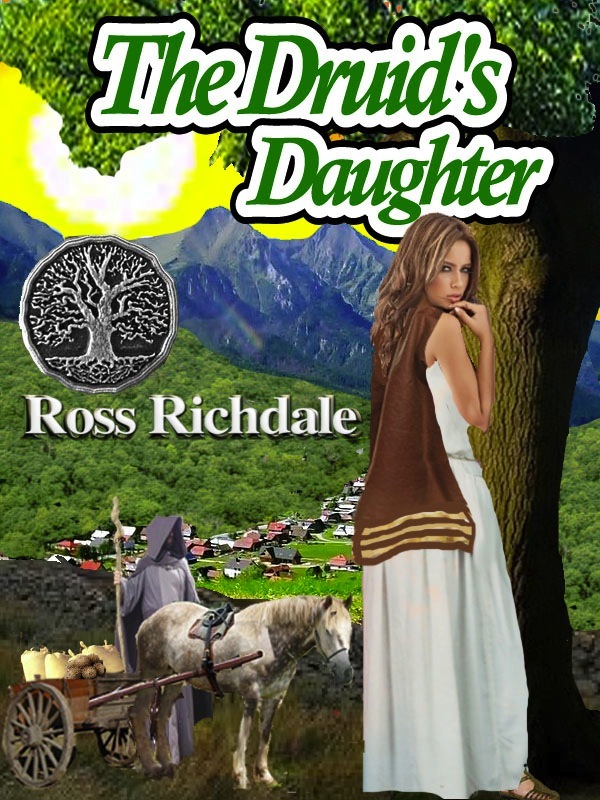 Druid Floyd asks his daughter, Jelena to go on a dangerous journey for him. Jelena stood beneath the towering branches of the oak tree and gazed down the hillside. She had seen the view a thousand times before but was still overcome by its beauty, especially at this time of the year with the spring festival of Imbolic to honour Goddess Brigit over. Robor the god of oak trees had again signified the coming of warm months with the oak forest behind her home village Darbarri, a sea of green with the mighty trees’ leaves a glossy green. The spirit of the oak tree never replied, not that she expected one but the mere knowledge that it was there was enough to give her the company she often strived for. Her smile turned to a frown when she noticed a boy climbing up the hillside and heading in her direction. She usually enjoyed Tadd’s company and if he wasn’t a male would have called him a friend. He was her age but seemed younger, perhaps that was why the boys were not declared men until they were nineteen while girls such as herself became women during the summer festival following their sixteenth birthday. She had just turned that age but dreaded the coming of summer season and the ceremony to call her a woman. This meant any man could court her and within a year she would be selected by one to be his bride. By eighteen she would probably be a mother as the wheel of life turned. She sighed. Already several of the men, some almost thirty began glancing at her in a strange way. It was her father who would choose her husband and that was something she was almost grateful for. Many men sold their daughters to the highest bidder and it was rumoured that one good quality milking goat or strong plough horse made the difference in who won the right to marry the man’s daughter. Wealthy men, of course were allowed up to three wives and the youngest one became almost a slave in the family home, forced to babysit her husband’s children by older wives and do all the household chores. Her own home was reasonably happy with her father being the Druid of the County and having only two wives. She had a ten-year-old half-sister Lilwen and two younger half-brothers by Middle Wife Adenydd and two baby half-brothers by Junior Wife Franci who was only four years older than herself. Her mother, Senior Wife Maygen had died of the fever when she was so young she barely remembered her but her father, Druid Floyd had insisted on maintaining the title, she guessed so her own position as senior child was maintained. “And why not?” she replied. “Not if our gods allow it,” Jelena retorted. They often had this playful argument about the gods with Tadd saying they were not really there. Underneath she half-believed what he said and that there was no Robor, the spirit of the trees, a god of thunder or any of the others. However, why should they be forced to believe what the Romans wanted? For generations, even before her great grandparents’ days, their village had been free of the conquering Roman Empire. Again this could have been because Darbarri was up a winding narrow gorge road two days march from the nearest Roman outpost but the gods could still be protecting them. “Anyway, why are you here, Tadd?” she asked. Jelena jumped to her feet and gasped. “Dad’s coming home!” she almost shouted. Before he could reply she skidded down the hillside for twenty metres, stood up and ran with her dress held up in her arms so she wouldn’t trip. Tadd usually overtook her in such a race but today she might be lucky. “So!” Jelena placed her hands on her hips and glowered. Jelena stared at him as the meaning behind his words sank in. Tadd wasn’t just the cheeky boy two houses away any more. He was a man, not nineteen perhaps but still a man. She felt strange inside, not scared but more at the opposite end of the feeling scale. Perhaps Epona, the goddess of fertility and the seasons had entered their lives. Her own life was about to enter a new season in the life wheel but she wanted Tadd to be there with her. She reached out, gave him a tiny hug and ran away down the lane between the village houses before he could reply.